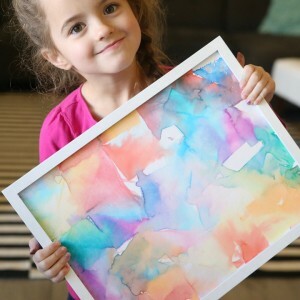 In today’s post: Kids and adults can create gorgeous artwork with alcohol ink and fire! 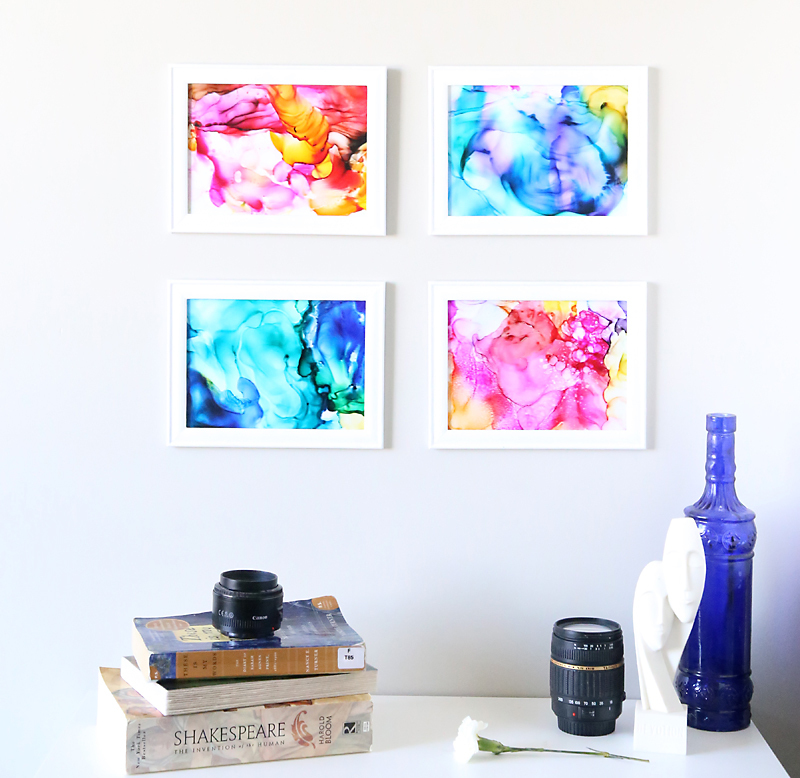 Everything you need to know to make alcohol ink art. I’m a pretty pathetic artist. It’s true. When I was a kid no one wanted me on their team for Pictionary because I couldn’t draw anything, and in junior high my art teacher used to say “tell me about this picture” because she didn’t want to admit she had no idea what it was supposed to be. So ya, art’s not one of my strengths. Which is why I like today’s project so much. 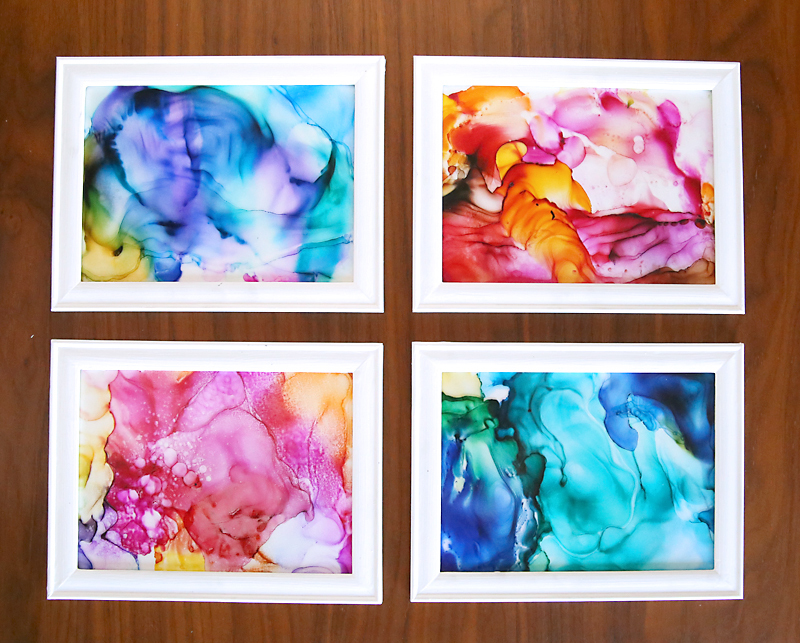 This easy fired alcohol ink art turns out beautiful and takes no artistic talent whatsoever. It’s so easy that kids can create a “masterpiece” in minutes, but it’s fun for adults to play with too. With only a few supplies and in only a few minutes you (and I!) can make pretty artwork for your wall. 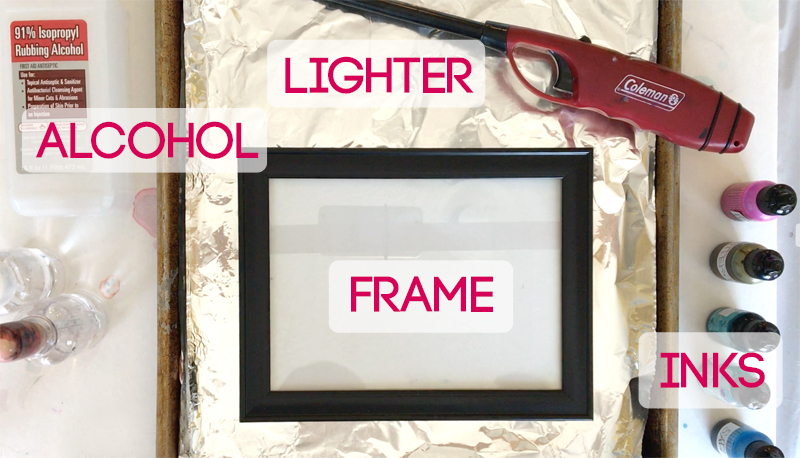 The process couldn’t be simpler: remove the glass from a picture frame. 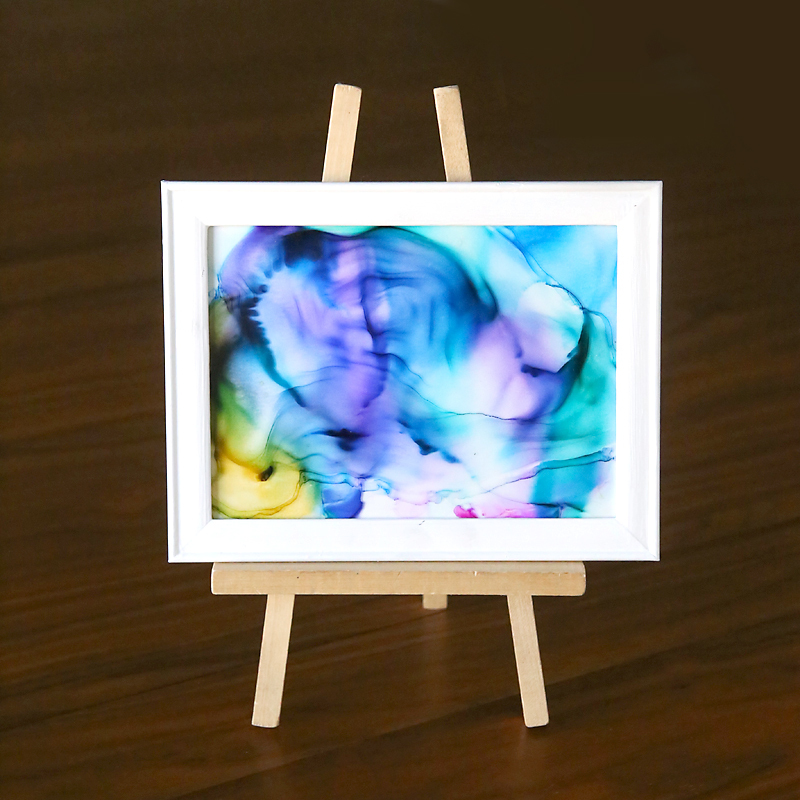 Drop alcohol inks onto the glass, then add rubbing alcohol. Swirl to combine, then light the alcohol on fire. 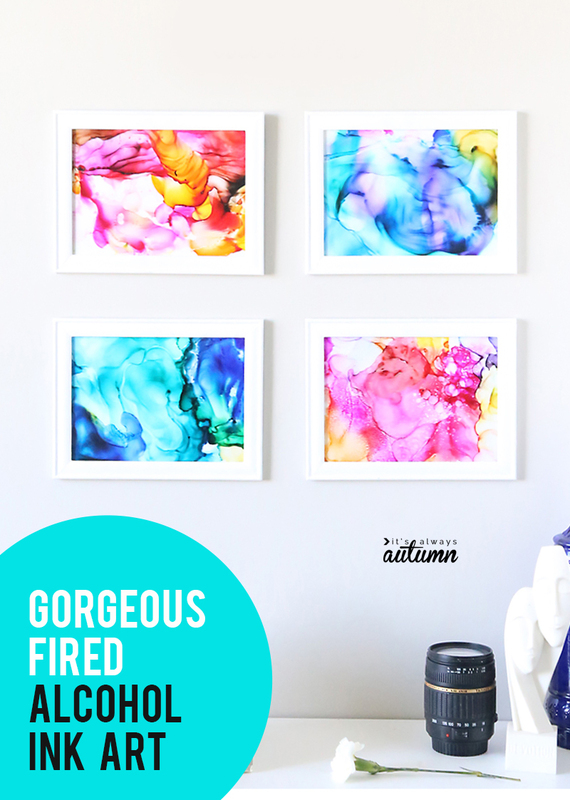 As the inks & alcohol burn, they create beautiful designs. 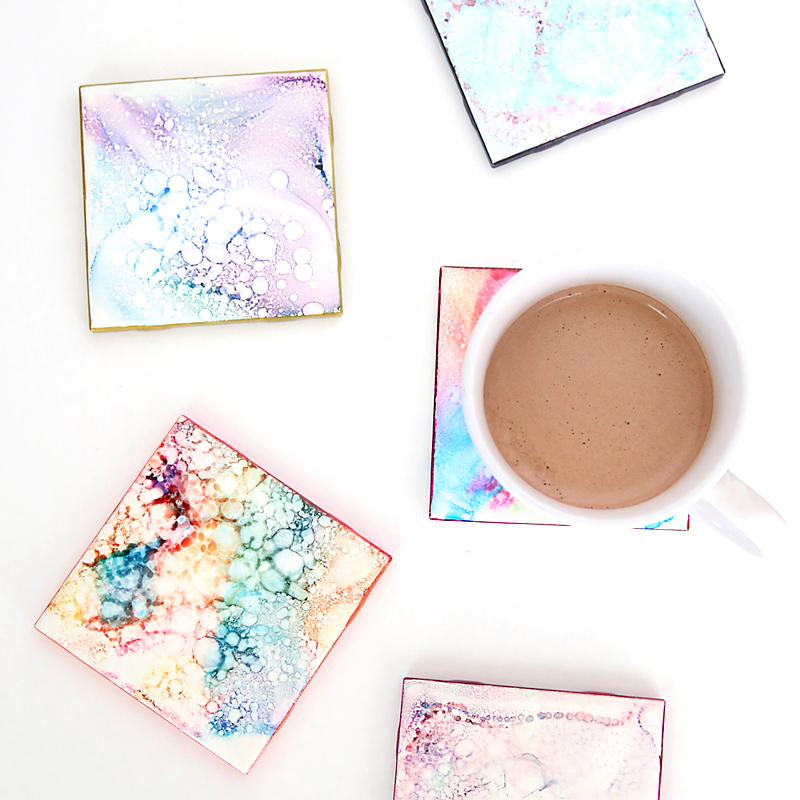 For this project, you want to use Ranger alcohol inks (affiliate link). You can order them online or buy them at your local Jo-Anns or Michaels. They are about $10 for a pack of three, so it’s nice to use coupons to get them cheaper. I’d probably recommend getting at least 6 colors, but it’s even more fun if you have a wider variety of colors to play with. Each bottle goes a long way so you’ll be able to use them over and over again. We used the glass out of dollar store pictures frames, but you can also use inexpensive tiles from Home Depot (the white 4×4 inch tiles are super cheap). If you don’t like how your design turns out, try adding more ink and more alcohol and lighting it again. It’s fun to experiment with different techniques to get different look on your alcohol ink art: try dropping the ink, swirling the ink, spritzing the alcohol instead of dropping it, etc. If you don’t like how your alcohol ink art turns out, just use straight alcohol to clean off the glass or tile and start over! Use 91% rubbing alcohol for best results (the stuff at the dollar store is usually only about 70%, so check the pharmacy section at a grocery store). After the fire has burned out, the glass will be completely dry. It also cools down quite quickly. Once you are happy with a design, you may want to seal it with polyurethane spray. Otherwise, if it gets wet it could smear. This is so awesome. I am definitely going to try this. It’s so simple and quick. That’s just up my alley for art projects. I’m absolutely rubbish at art, so this will be perfect for me. Thanks for posting such awesome art! Autumn, I love this and I think even I will be able to do this.i am going to pin this. Thanks for sharing. I’ve been making ones with permanent markers. It is so easy and fun….and, no two ever turn out the same. Unique art for everyone! I love doing art projects with the family. I am planning on doing this one of the first few weeks of summer break. Also, thank you for letting us know where to purchase the ink. This is beautiful artwork, I can’t wait to try it myself. Love these! Where can I purchase the inks in Australia? with the coaster tiles and permanent markers do you fire them with out adding anything else? Thanks for this great technique, will definitely give it a try with my great nieces when they visit. Always looking for new stuff to do with them. Will have to investigate our UK craft shops for the inks. I tried this last night and LOVED it! 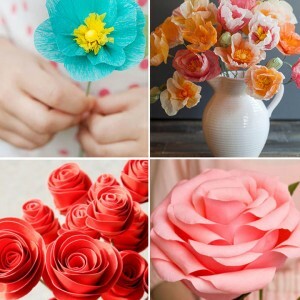 So easy and inexpensive…. and I liked not knowing exactly how it would turn out! This was so do-Able. Made a wall full of beautiful art for only $60 and 2 hours! 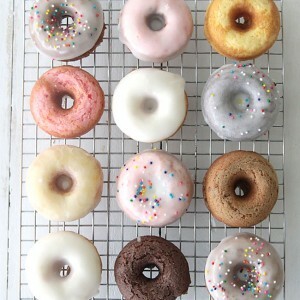 Wow, these look really pretty. Thanks for sharing the idea, I’ll definitely have to try this with my nieces and nephews. What brand of poly spray did you use? Water is eating through the kind I Used even with 3 coats. This year has not been kind to our budget so I have been on the lookout for inexspensive DIY gifts for Christmas. This project is SO PERFECT! I have some alcohol inks I bought for decorating gourds so I am ahead of the game. Watch out Dollar Store – I’m on my way to grab some frames. Thank you so much for sharing such a unique and striking project. You may have saved my Christmas. I did this craft with older scouts, and it was fantastic! They like this more than anything they’ve done in years. Super for presents. And the cost was nothing! The glass would be pretty hanging in a window too, I can imagine to gorgeous glow throughout the house when the sun shines through them. I tried this but it did not work, the alcohol would not light, (only had 70% in house) Is it not flammable enough? Yes, I think you do need to higher concentration of alcohol to get it to light. You should be able to find it at any pharmacy section of a grocery store. Good luck! I am hosting a kids art camp for ages 5-9 that is underwater and ocean themed. I would like to know if you have any recommendations for my theme. I am having a hard time finding ideas. I would like the instruction for the Fired Ick Art. Could not fined a way to print it out. Can you help me? Thanks. 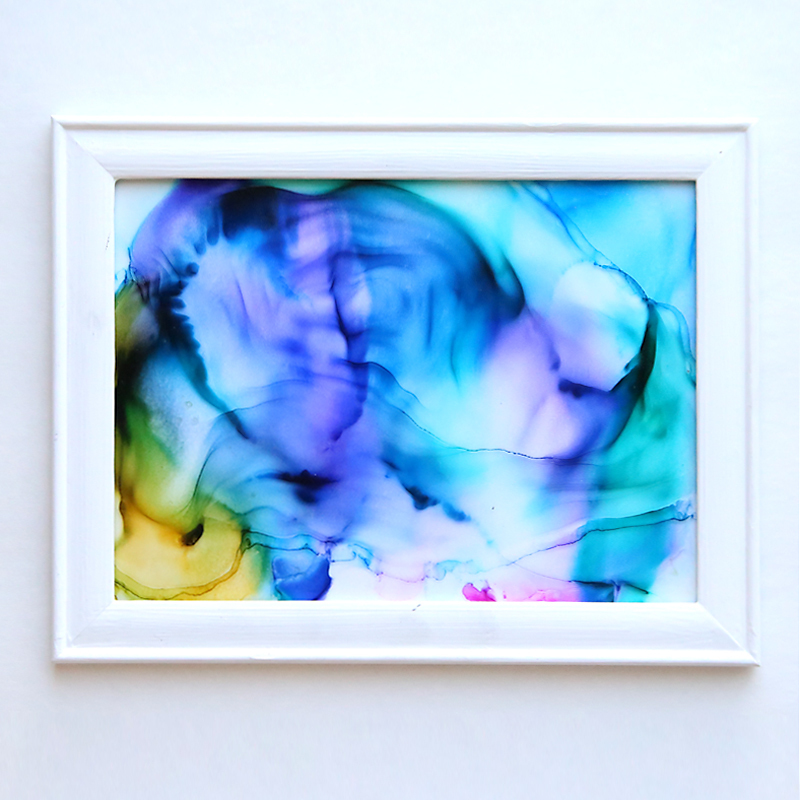 You can make your own inks, with 90+% alcohol and inexpensive marker pens. There are loads of video online to show you how. Would it be okay to use clear coat spray instead of polyurethane spray? This looks real good….can’t wait to try this. I’m not sure about plexiglass – you’d just have to try it out. However, I’m pretty sure the pieces I used for this post were not actual glass because the frames were just from the dollar store, so it may be just fine! I’m not sure how much heat is transferred to the glass base in this art method but plexiglass, although incredibly useful for so many things because of how tough it is, does indeed burn! I am uncertain of its heat threshold but it is a form of plastic components and when it gets going it really turns into a black melted ‘blob’ and does give off toxic fumes. In ant thing such as this craft I would be very reluctant to use it although you could try it on a small test piece. I know it sounds expensive but if I wanted to make a later piece of art using this technique I would go to a store thst specializes in glass (not the specialty expensive glasswork art stores but regular window, rtc, glass replacement pieces). They are more than willing to cut pieces of glass of any size and thickness you want at reasonable prices. Also, I have always made a habit of just visiting thrift stores now and then and checking out donated pictures. I do this mainly to check for great ‘matting’ of the art not the pictures themselves. Some can be quite large and sell very reasonably. Matting I’d very expensive here. Antique or fancy frames really aren’t available as people are far more aware of what they cost. But even if the picture is not matted if it has glass over it the pieces you can get can be quite large. Just a suggestion. This sounds so neat and I just know my boys will LOVE it! Your video is a link to something totally different. It would be wonderful if you could change it to the correct one! Thanks! Sorry about that Doreen. The right video is actually there, you just have to watch a 15-30 second ad first. Some of my videos are monetized with ads at the beginning since running this blog is a full time job and ads mean I don’t have to charge readers for any of my content. If you don’t want to wait for the ad, the written instructions should give you all the info you need to do the project. Thanks so much for visiting! Hello. Very cool idea!! I would recommend to parents to do this in a well ventilated area, the fumes from the alcohol ink and alcohol can be hazardous to breath in and also are not great to get on the skin. Wearing gloves might not be a bad idea either. Looks amazing! 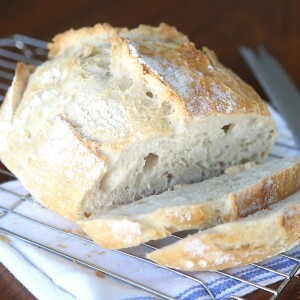 So simple and quickl, I’m definitely will try this, hope my kids will love it :)). Thanks for sharing Autumn!